We have 5 to be won! Launch interceptors! 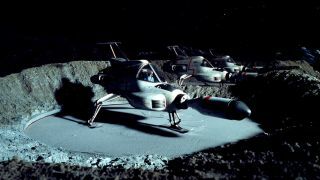 Gerry Anderson's UFO was the legendary puppet master's first excursion into live action SF TV. Set in a fraught near future, it pitted the forces of SHADO - Supreme Headquarters Alien Defence Organisation, no less - against a rapacious extra-terrestrial threat with designs on the planet. Packed with stunning FX, wondrous vehicles and top-notch guest stars, it remains a cult small screen classic.